The Parish Council formally submitted its proposal to be designated as a Neighbourhood Planning Area to Guildford Borough council in January 2013. Following a formal period of consultation the parish council has now been formally accepted as a relevant body and the area has received recognition as a Neighbourhood Planning Area. A Steering Committee was set up to manage the process of engagement with local residents, to understand the views of local people in a number of key planning areas. You can read a copy of the formal submission document by clicking on the link below. 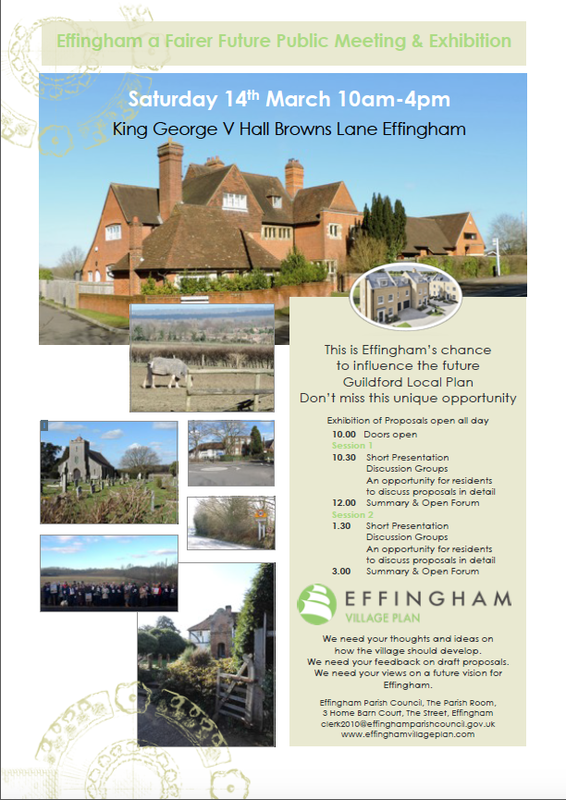 With the announcement from Berkeley Homes and The Howard Partnership Trust of plans to build 295 new houses on three sites, and a school for 2000 pupils on Effingham Lodge Farm, EPC and VPSC agreed to refocus efforts behind understanding the response amongst residents to these proposals and to those relating to Effingham in the Draft Local Plan. The team has been working over the last year with residents to review these proposals culminating in two Public Meetings – September 13th and on December 9th 2014, setting out a detailed analysis of the proposals. EPC met formally to vote on the proposals and vote to reject on the grounds set out in the review. Details of this review are given in the presentation below. The objections to the local Plan can be found on the EPC website. 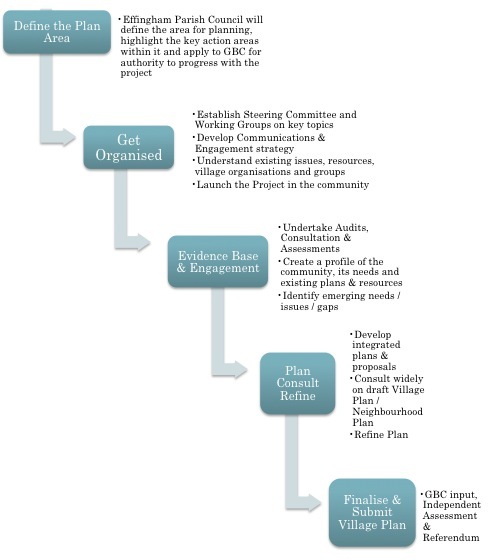 This is a key step in the process of developing our Neighbourhood Plan. We needed to understand the needs and future requirements of residents for housing. We also took the opportunity to ask questions about village services and facilities to understand what people wanted from the village in the future. The results of this survey can be found on the Housing section of the site. VPSC attended two Village Days, taking a stand to interview residents to understand key issues in the village. This along with our ongoing engagement at Parish Council Meetings and via the survey and launch meeting has helped us to shape some draft policy objectives and proposals. These are now set out in the relevant sections of the website. We hosted a very successful event at KGV to share initial thoughts across the 5 focus areas of the Neighbourhood Plan. Residents really got into the ideas and were enthusiastic in giving their thoughts and responses to the proposals. The proposed draft policies can be found under the relevant area of the website and are currently being reviewed prior to a further consultation planned for June. In November 2015, the latest draft plan was submitted to an Independent Examiner for a comprehensive ‘Health Check.’ The purpose of this review was to ensure that the Plan was written in such a way that it complied with all technical requirements and planning legislation. This was an extensive piece of work and has proven invaluable in helping the team revisit the policies and ensure they are written in the technically correct manner and reference the appropriate ‘Strategic Planning Legislation.’ A revised draft, taking account of the comments of the Examiner is now being drafted for further public scrutiny. The Effingham Neighbourhood Plan Advisory Group has been established. Details can be found here. This team of resident and councillors are responsible for development of the final draft plan, taking forward the ideas of residents from all the public meetings and translating the idea into planning policies within a draft plan. Housing workshops took place at the KGV hall, with 40 residents giving up close to 4 hours of their time to explore site selection criteria, to evaluate the potential of around 20 sites nominated by landowners and resident organisations, and to agree a short list of potential sites for inclusion within the plan. Feb-April Policy Drop in surgeries at the Parish Room to review every policy within the draft plan. April 19th 2016 Draft Plan presented to Effingham Parish council for approval to proceed to village wide survey. This marks our formal Regulation 14 consultation.